Endeavour which flew its final flight on STS-134 is now in OPF-2 (Orbiter Processing Facility 2) where it is being readied for being turned over to the California Science Museum in September 2012. 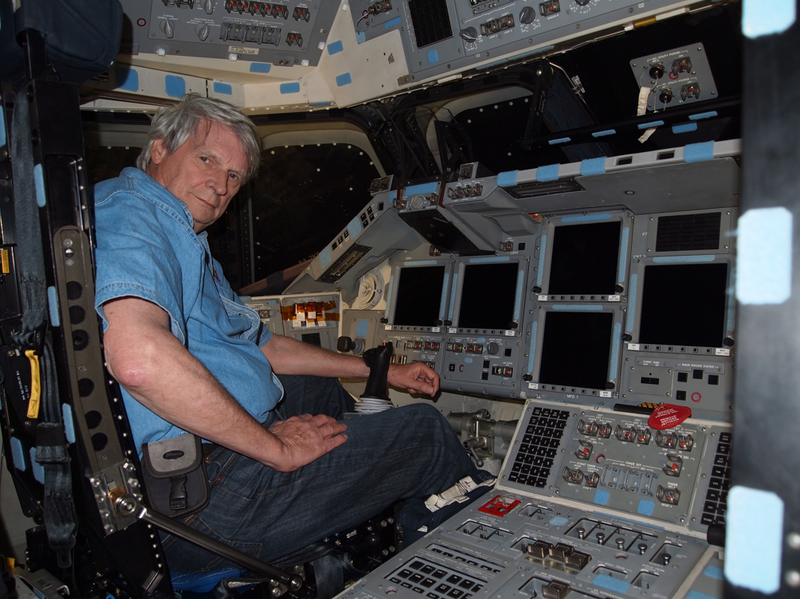 Pete Crow in the Commander seat on the flight deck of the Space Shuttle Eneavour on March 7, 2012. The photograph is by Tony Achilles of radio station WPKN in Bridgeport, CT.
As NASA did with the shuttle Discovery, the media was invited to have a look around on March 7, 2012 including visits to the flight deck. The Houston Johnson Space Center will get the shuttle mockup that has been at the Kennedy Space Center. It is on the dock at KSC in front of the Media Site 39 awaiting its barge ride to Galveston, Texas. New York City will get, or may already have, the shuttle mockup that has been at the Smithsonian Museum at Dulles Airport. DISCUSSION OF THE SHUTTLE TILES and challenges they presented to the NASA ground crews. This runs about five minutes. Tony Achilles, WPKN in Bridgeport, Connecticut, shot this footage. This clip, which features Pete Crow interviewing Mr. McKenzie can also be found here. More of Mr. Achilles excellent footage of others events can also be found at this link. NASA invites everyone associated with the shuttle, including the Media, to sign the walls of the White Rooms which will go to Museums. 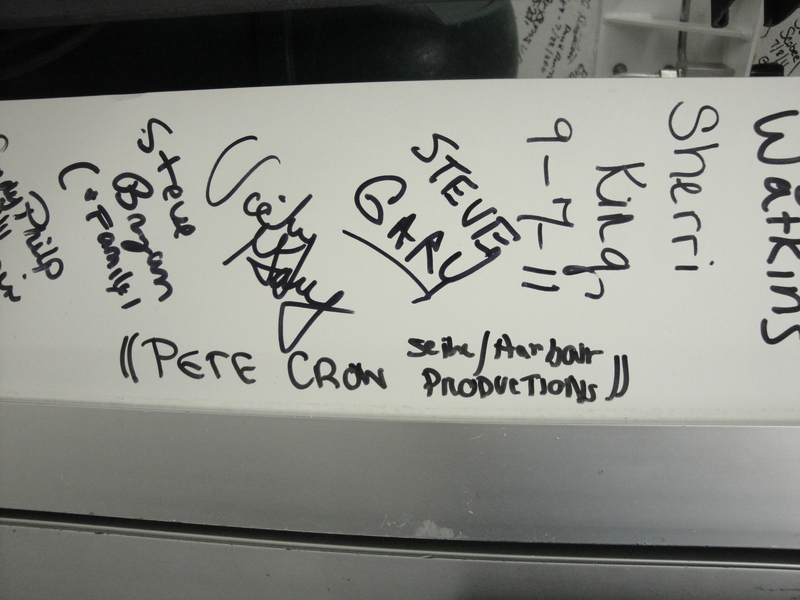 Pete’s signature is at the bottom of the Endeavour White Room wall on your right as you enter. .”petecrow/NASA” is jointly copyright © 2012, by Seine/Harbour® Productions, Studio City, CA, and by the Peter Michael Crow Trust.